Normally you would use Movienizer to create a catalog of all movies that you have in your home collection. Such movies can be added by title, by barcode, from DVD/Blu-ray discs, from files and folders. 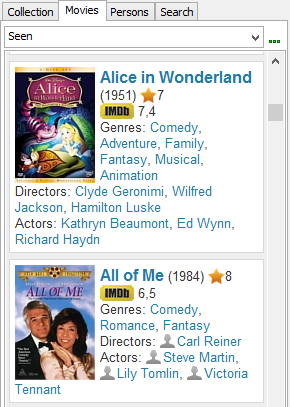 You can mark movies as seen and assign them your own rating, which helps selecting your favorite movies later. However, some movies may be not worth keeping, and you may give or sell the corresponding disc, or delete the corresponding video file. This takes you to the situation where the movie is no longer in your collection, but you still have seen it (obviously, there is no way to "unwatch" a movie). 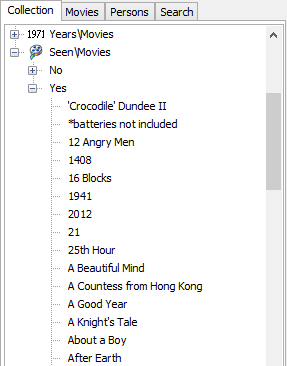 When you uncheck the "In collection" box, the movie disappears from most lists in Movienizer. You can still find it in a filmography, but otherwise it is not available. Now, suppose that you'd like to build a list of all movies you ever saw, including those that you don't have in your collection. Is this possible with Movienizer? We can easily display all unseen movies using the Quick Filter menu, but what about seen ones? But this will only show movies from our collection. 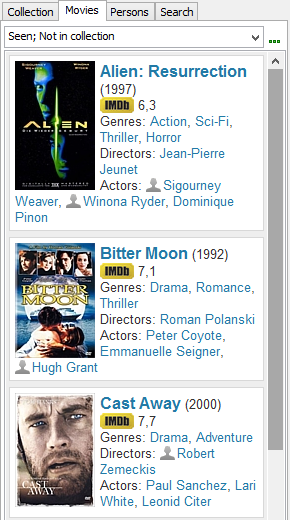 To display all seen movies, we will need to switch "Quick Filter" - "Information output" to "Show all data". This list can be exported or printed using Reports. 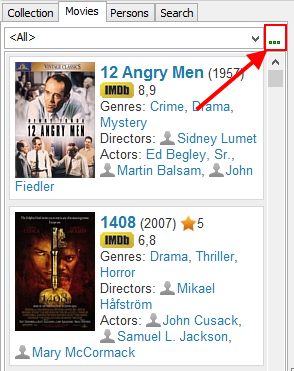 Another solution involves extended filters and allows showing all seen movies on the "Movies" tab. Also there is no need to change the "Information output" setting. At the top of the tab, there is a dropdown list that may contain extended filters (if you have already created any). We need to create a new filter right now. Click the "..." button. 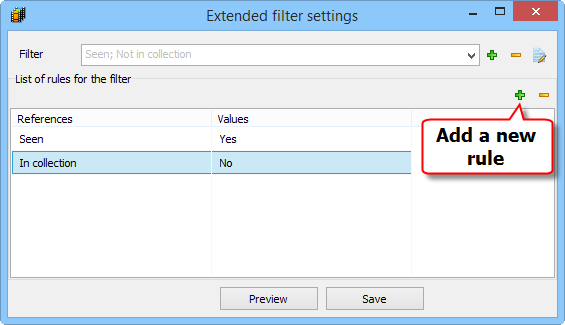 Click the upper plus to create a new filter. The filter will be created with one rule. By default, the "In collection" field is suggested, but we can click it and select a different field. We have selected "Seen" - "Yes". Now click "Save" to save the new filter. "Seen" - "Yes", "In collection" - "No". Click "Save" to save the changes. 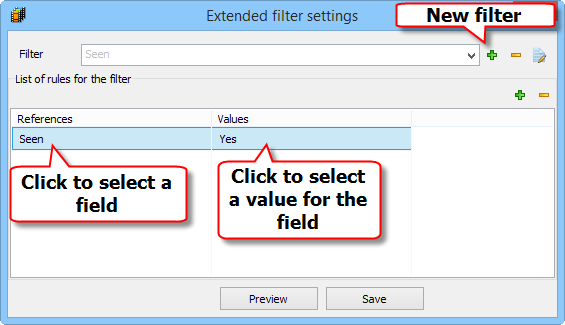 With extended filters, you can also add other rules to refine your request as needed, but this is beyond the scope of this article.